Style With The Average Nigerian Girl – Shifting With Ankara! Hey Dolls! I’m back with another style inspiration. This time, it’s one of my all-time favorite pieces; A shift dress. Not just any Shift Dress, an Ankara shift dress. 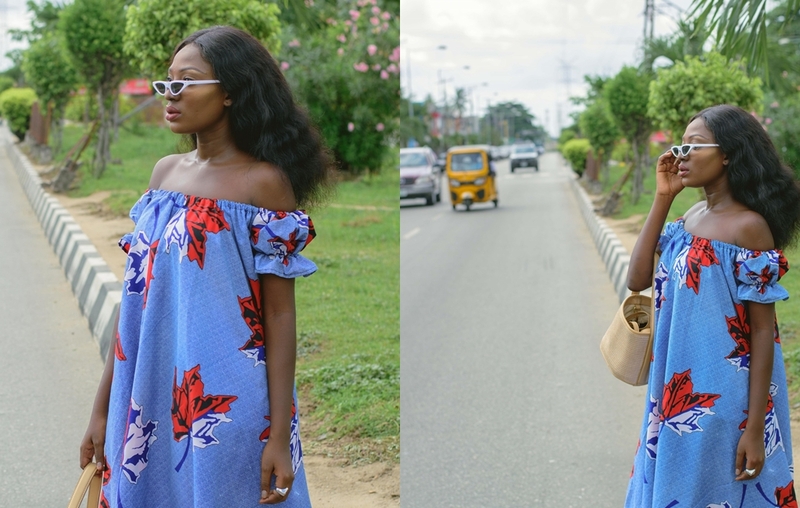 Not just any Ankara Shift Dress, an Off-shoulder Ankara Shift Dress! Okay now you get it, I have 3 of my favorite styles in one dress, pardon my excitement! Ankara shift dresses are so comfortable and chic, versatile too so it’s quite easy for one to get obsessed with them, I mean comfort is key and if you can stay super stylish while being comfortable, Win-Win. The print on this particular dress is so pretty, I love how big and distinct the flowers are. The fabric is also top-notch, it’s not the weight-less type of Ankara so it doesn’t just fly up with the wind, it stays down and just swooshes around the knees (unless I purposely twirl). I like that this dress can be styled up (like I did here) or down (most likely with sneakers because I’m a sneaker-head). Like I said, it’s very versatile and can be worn to a vast number of events- church, weddings, casual hangout, date night etc. It’s is a timeless style with a simple silhouette that looks good on anyone. Depending on your body type, you can decide to make yours shorter. I’m a big fan of off-shoulder (link last post) but I can also style this as a mono-strap dress by simply pulling one side down and folding the sleeve in. Also, because the body of the dress is a bit bulky, it won’t be obvious that it’s a converted mono. I styled the dress with white pumps, white retro cat sunnies and a straw bucket bag to keep it simple and chic. White accessories easily glam up an outfit especially if you want to keep it chic and minimal. What are your thoughts on the Ankara Shift Dress? Meek Mill Says He Feels Like A Free Slave!!! Good News To All Rap Heads! J. Cole Is In Nigeria!! !